"Home Of The Bargain Queen"
Yesterday, while watching the news I learned about El Niño, which was fortunate for me because I was beginning to think that I was experiencing some major hot flashes. :) Being December here in Florida with record high temperatures of 85o degrees my northern sensibilities was finding this unusual hot weather, as the kids say today - a drag. So after dinner to treat myself I made a delightful frosty dessert. It is fairly easy to make and is tasty and cool on any hot day, even on days in Florida with El Niño passing through town. All you need is the following. 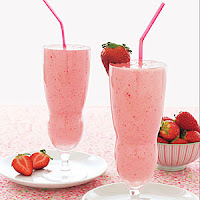 Add strawberries, ice cream, and cool whip in a blender. Blend ingredients to a thick and creamy shake. Pour shake into your favorite drinking glass or glasses and enjoy. Wow, what a wonderful cooling taste. It strongly reminds me of the Creamsicle ice cream bars we use to buy from the ice cream man when we were children way back when. ‘Seven Ninety Seven’ Home Of The Bargain Queen is about bargain shopping, product review, easy to fix recipes, cleaning tips, and money saving household tips. Hope you find the side bar links and RSS interesting, useful, and fun. So, thank you for visiting. Why I don’t add much casual summer wear? I remember a time before long slacks for women became an acceptable norm. It was a time in which women dressed more stylishly and glamorously and felt more feminine too. This is another Seven Ninety Seven goal. To recommend to women of like minds more stylish fashion reminiscent of the dresses women once enjoyed wearing for whatever reason or occasion at reasonable prices. You don’t have to be a star to look like one. Remember cutting corners does not equate to being cheap. What cutting corners do equate to is having the know how to purchase high quality goods, save money, and live well. And, making life easier is Seven Ninety Seven goal. The Amazing Chocolate Cake In A Mug! The Dilemma Of The Ball Park Buns?!! Wow! Spring Savings are Blooming Everywhere! A®Widescreen Online Review Member©2015-2019 Seven Ninety Seven.. Powered by Blogger.